The Kyrion CM5000 is a new modular hardware encoder dedicated to contribution over satellite and IP / ASI networks. It can be configured as a single or dual channel encoder, or single channel encoder and DVB-S/S2 modulator. Optional audio boards for analog or digital inputs can be added on two extension slots. The Kyrion CM5000 delivers all MPEG-2 and MPEG-4 AVC video compression flavors: from SD to HD and 1080p50/60, and from 4:2:0 8-bit up to 4:2:2 10-bit with unrivaled video quality and reliability. The CM5000 front panel and web interfaces meet all operational expectations with quick access to configuration menus and immediate settings ensuring afast transmission start. 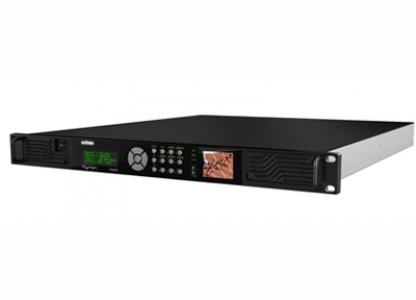 Based on ATEME‘s unique FPGA design, the Kyrion CM5000 is fully upgradeable and future proof, allowing broadcasters,satellite up-links, service operators, and DSNG professionals to benefit from the state-of-art in video compression technology.